The Dataprobe iBootBar iBB-N15 is a Remote Reboot Power Strip with Single NEMA 15 Amp Linecord, and 8 NEMA Outlets. The iBootBar reboot power strip allows you to control each outlet independently from Web, Telnet, SNMP and have network access plus out-of-band control via serial port and internal modem with both data and DTMF tone dial control. iBootBar is available with single or dual power inlets. Dual power is ideal for remote reboot control servers, routers, etc. with redundant power supplies. Simultaneously switch both supplies off and on for reboot, security or energy management. These models are also ideal for switching higher current devices. Each inlet is distributed to 4 outlets, which can be switched in pairs for redundant systems, or individually for higher current devices. The internal modem option allows connection to the iBootBar from anywhere, anytime. Dial-in with a laptop or terminal for complete control of all functions, or access iBootBar with any telephone for quick power on, off or reboot functions. Telephone users are guided with voice prompts and status information. This remote reboot unit continuously monitors the current draw from its outlets and reports user settable high and low current alarms. 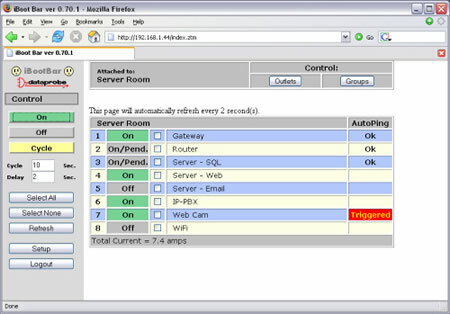 Alarms are delivered both by email and SNMP traps. The web browser interface provides the easiest means of managing multiple outlets. One master unit can be connected to 15 expansion units, managing 128 outlets from a single web page interface. Multiple users, each with administrator assigned rights only see the outlets they are responsible for. Outlets can be linked together in logical groups, even across managed units, to allow simultaneous power control or reboot with a single command. Groups can also be used to link pairs of outlets together to reboot devices with dual redundant power supplies. In addition to the Web interface, the outlets can also be controlled via Telnet, Serial, and SNMP. Access from any Network point or any Telephone - No field trips required for Reboot. Save time and money by eliminating service calls and reducing downtime to a minimum. IP Addressed, 10/100Base-T - Use on any Ethernet IP network. Public or private. Supports DHCP and alternate ports for Web Access. Automatic Reboot Operation - Auto-Ping Automatic Operation for crashed devices. Auto-Ping pings device and takes action when no response. Complete control over frequency and timers. Current Sensing and Alarms - Know when critical power conditions occur and take immediate action. Email and SNMP Trap notification. Dual and Single Power Inlet - Supports dual redundant powered devices with a single click. Group and Stagger - Combine any outlets into logical groups and power up devices in sequence to reduce power surges. 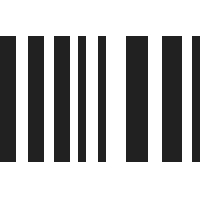 Port Assignable for Web and Telnet. Question: what is the lead time for this product? I will need 20. Answer: We can typically ship these within 48 hours from the time of order. Question: Do you have a product that operates from -29 to 165 degrees F? Answer: We are having trouble locating one, but we will keep looking and update if we find any.